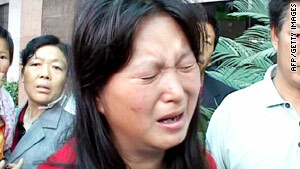 A Chinese woman cries after learning her child was killed in an attack on a kindergarten. Linchang Village, China (CNN) -- The man who hacked seven kindergarten students and two women to death in northwestern China owned the building where the attack occurred and was in a property dispute with the school, police said, according to state-run media. Police identified the attacker as Wu Huanming, 48, and said he'd insisted in April that the house he was renting to the school be vacated after the lease expired, the official Xinhua news agency reported Wednesday. It's unclear whether the lease had expired, Xinhua said. The attacker used a kitchen cleaver to kill the school's owner, Wu Hongying, and five boys and two girls on Wednesday morning before returning home and committing suicide, state media said. The school owner's mother, who was wounded in the attack, later died at a hospital, Xinhua said. Eleven other children from the attack remain hospitalized, including two with severe injuries, according to Xinhua. The attack occurred in Linchang Village, in Nanzheng County's Shengshui Township. Police had cordoned off the village Wednesday,as they conducted their investigation, with locals allowed in but reporters kept out. Video: What's behind school attacks? Twenty children attended the private school, officials said. It was the sixth such attack in China on schoolchildren since March. China's ministries of public security and education held an emergency nationwide teleconference to tell local departments to increase security after Wednesday's attack, Xinhua reported. On April 30, a man armed with a hammer injured five preschool children in east China before setting himself on fire in a classroom suicide, a government spokesman told Xinhua news agency. The attacker held two children in his arms as he poured gasoline over himself, the spokesman said. Teachers in Weifang City, Shandong province, pulled the children away, as the man died, the spokesman said. On April 29, at least 28 children were injured when a man with a knife attacked a kindergarten in east China, state media said. Most of the victims were four-year-olds, and three of the children were in critical condition. Police arrested a 47-year-old suspect. The incident happened in Taixing city in Jiangsu province. On April 28, a man attacked 18 students and a teacher with a knife at a primary school in southern China's Guangdong province, Xinhua said. The attacks come despite the execution of Zheng Minsheng, 42, a former community doctor who stabbed eight children to death and wounded five others at an elementary school in eastern China on March 23. Zheng, executed by a firing squad in Nanping City late last month, told investigators he carried out the attack because he was frustrated by "failures in his romantic life and in society," according to Xinhua. China Daily newspaper quoted Nanjing University sociology professor Zhu Li as saying Zheng's attack inspired copycats. "Some people may not have thought about stabbing school children, but due to the media's coverage of such a case, they got an idea," Zhu said. Chinese authorities have begun teaching safety awareness in school curriculums, China Daily reported. CNN's Wen-Chun Fan contributed to this report.